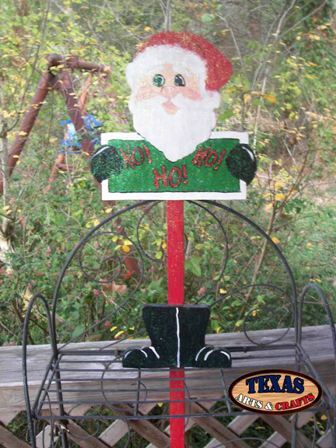 We build the Santa yard sign in our workshop. Santa is hand painted red, white, green, and black. The dimensions are approximately 17.50 inches tall by 13 inches wide by 1.50 inches deep. The yard art has a 20 inch stake. The item weighs approximately 2.75 pounds with packaging. For the continental U.S. shipping and handling is included in the listed price. For shipping outside the continental U.S. please contact us through our Contact Us page. 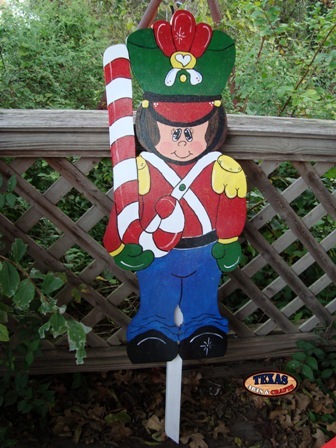 We build the Toy Soldier yard sign in our workshop. The Toy Soldier is hand painted red, white, green, and blue. The soldier is holding a candy cane. The dimensions are approximately 33 inches tall by 14 inches wide by 2 inches deep. The yard art has a 28.50 inch stake. The item weighs approximately 5 pounds with packaging. For the continental U.S. shipping and handling is included in the listed price. For shipping outside the continental U.S. please contact us through our Contact Us page. 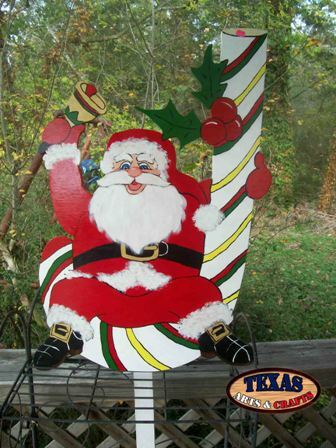 We build the Toy Stocking yard sign in our workshop. The toy stocking has many different toys hand painted in. The dimensions are approximately 33 inches tall by 20.50 inches wide by 1.50 inches deep. The yard art has a 31 inch stake. The item weighs approximately 6 pounds with packaging. For the continental U.S. shipping and handling is included in the listed price. For shipping outside the continental U.S. please contact us through our Contact Us page. We build the Christmas Tree in our workshop. The Christmas tree is painted green, white and yellow. The tinsel can be either red or blue. The dimensions are approximately 30 inches tall by 22.50 inches wide by 2 inches deep. The item weighs approximately 4.75 pounds with packaging. For the continental U.S. shipping and handling is included in the listed price. For shipping outside the continental U.S. please contact us through our Contact Us page. 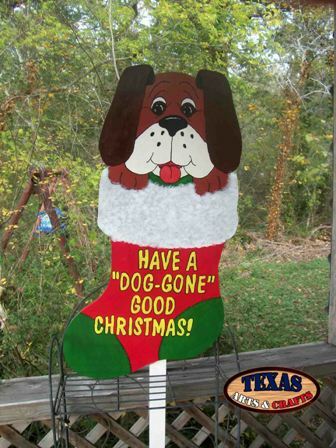 We build the Dog Stocking in our workshop. The stocking is hand painted red, green, and white. The dog is painted brown. The dimensions are approximately 34 inches tall by 18.50 inches wide by 2 inches deep. The item weighs approximately 5.50 pounds with packaging. For the continental U.S. shipping and handling is included in the listed price. For shipping outside the continental U.S. please contact us through our Contact Us page. 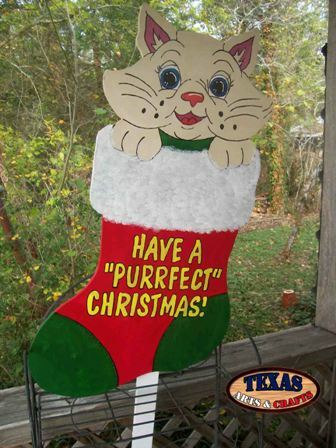 We build the Cat Stocking in our workshop. The stocking is hand painted red, green, and white. The cat is painted a light brown or beige color. We build the Santa With Candy Cane in our workshop. The arts and crafts item is hand painted red, green, white and yellow. The dimensions are approximately 30 inches tall by 21 inches wide by 2 inches deep. The item weighs approximately 5.25 pounds with packaging. For the continental U.S. shipping and handling is included in the listed price. For shipping outside the continental U.S. please contact us through our Contact Us page. 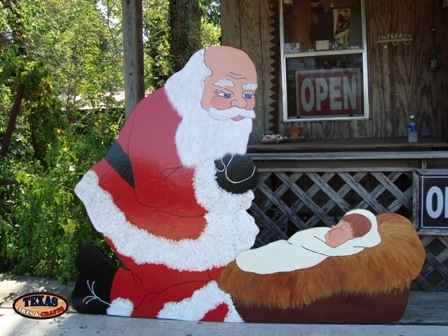 We build the Santa With Jesus yard sign in our workshop. 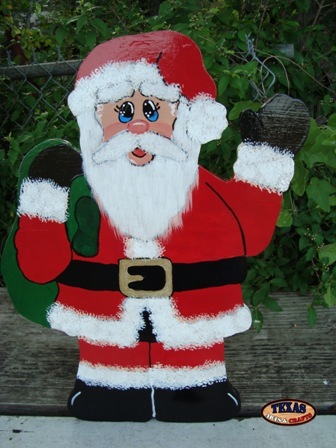 Santa is hand painted red, black, and white. Baby Jesus is painted in a white blanket on a pile of yellow-brown hay. The dimensions are approximately 39.50 inches tall by 49 inches wide by 1.50 inches deep. The yard art has a 36 inch stake. This arts and crafts item is very large, and can only be picked up at our store or at one of our craft shows. 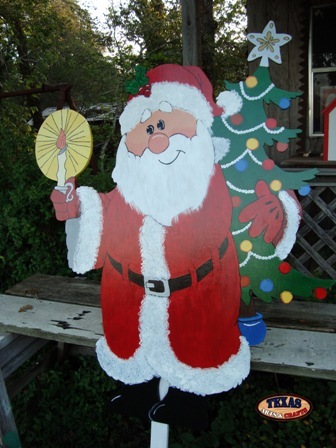 We build the Large Santa yard sign in our workshop. Santa is hand painted red, black, and white. He is holding a candle and a decorated Christmas tree. The dimensions are approximately 53 inches tall by 46 inches wide by 1.50 inches deep. The yard art has a 63 inch stake. 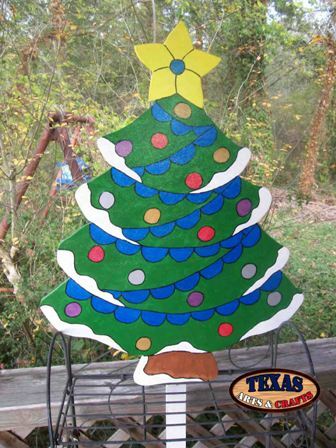 This arts and crafts item is very large, and can only be picked up at our store or at one of our craft shows. 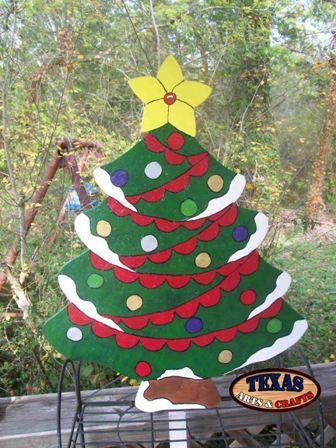 We build the Reindeer Lights yard sign out of cedar in our workshop. The reindeer is hand painted with white wash (thinned white paint). The base is painted red with greenery wrapped around it. The sign is painted green and reads Seasons Greetings. 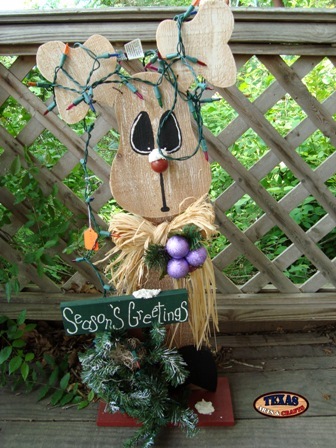 The sign has 50 mini lights wrapped around its antlers and the base. The dimensions are approximately 33 inches tall by 12 inches wide by 5.50 inches deep. This item is very delicate, and can only be picked up at their store or at one of their craft shows. We build the Santa Boots in our workshop. The arts and crafts item is hand painted red, green, white and black. The dimensions are approximately 19 inches tall by 12 inches wide by 2 inches deep. The Santa Boots has a 36 inch stake. The item weighs approximately 2.75 pounds with packaging. For the continental U.S. shipping and handling is included in the listed price. For shipping outside the continental U.S. please contact us through our Contact Us page. 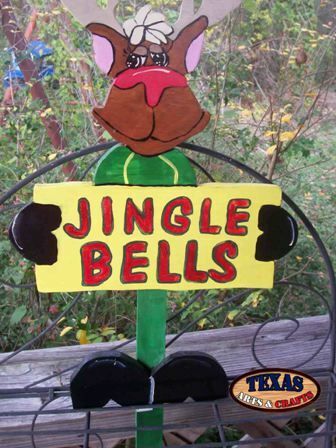 We build the Jingle Bells sign in our workshop. The arts and crafts item is hand painted red, green, black, brown and yellow. The dimensions are approximately 19 inches tall by 12 inches wide by 2 inches deep. The sign has a 36 inch stake. The item weighs approximately 2.75 pounds with packaging. For the continental U.S. shipping and handling is included in the listed price. For shipping outside the continental U.S. please contact us through our Contact Us page. 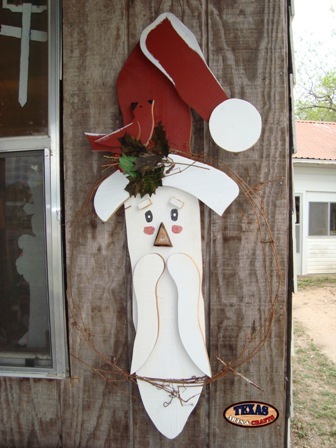 We build the Santa Wreath Hanger in our workshop. The arts and crafts item is hand painted red and white. It has a small wreath around the face of Santa. The dimensions are approximately 42.50 inches tall by 19 inches wide by 1.75 inches deep. This item is very delicate, and can only be picked up at their store or at one of their craft shows. 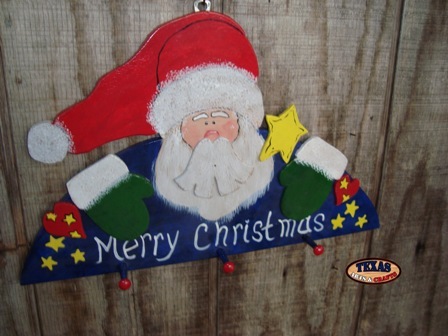 We build the Merry Christmas Santa Hanger in our workshop. The arts and crafts item is hand painted red, white, blue, green, and yellow. It has small pegs in which you can hang a hat or scarf on. The sign reads: Merry Christmas. The dimensions are approximately 10.50 inches tall by 16.50 inches wide by 1.50 inches deep. The item weighs approximately 2 pounds with packaging. For the continental U.S. shipping and handling is included in the listed price. For shipping outside the continental U.S. please contact us through our Contact Us page. We build the Snowman Stocking in our workshop. 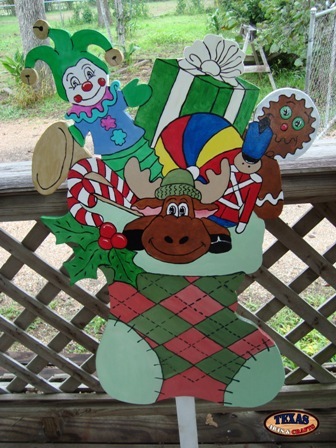 The arts and crafts item is hand painted with a red sky, green Christmas trees, and a white snowman. 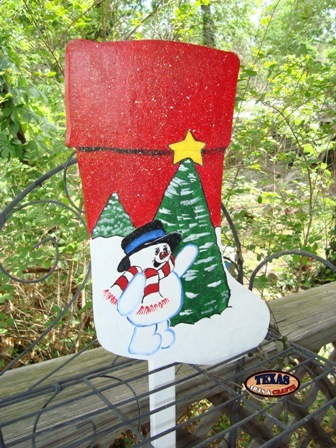 The snowman is wearing a red and white scarf with a black and blue hat. The dimensions are approximately 18 inches tall by 11.25 inches wide by 1.50 inches deep. The item weighs approximately 5 pounds with packaging. For the continental U.S. shipping and handling is included in the listed price. For shipping outside the continental U.S. please contact us through our Contact Us page.